Have you ever read a book, and regardless of the fact that the main question was answered, you want it to continue? That is where I am right now.... 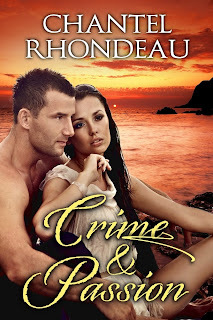 I recently finished Crime and Passion by Chantel Rhondeau, and I want more! Lucky for me, I have a small library's worth of cheap and/or free books on my handy-dandy Kindle app. Which, is another thing worth mentioning.... I have only recently gotten on board with this whole digital reading thing. I tend to prefer to physically hold my book and turn the pages between my fingers, but that is becoming less popular apparently. I still love to have a good paperback, but I have definitely enjoyed the simplicity of reading on my phone. I can read while feeding the baby, laying in bed at night (without a light), and while walking the dog.... Ok, not quite while walking the dog, but you get the point. There is this guy who walks around the neighborhood reading a book-like literally, his nose is in a book....How has he not been hit by a car? And should he get some kind of prize for 1-not getting hit by a car and 2- working out his mind and body at the same time? Definitely more ambitious than myself, but I digress.... I may not have walked the dog while reading, but I certainly did test my multitasking capabilities while reading Crime and Passion because I couldn't put it down! I LOVED this book. I am typically the play-it-safe kind of reader. You know, the one who finds an author, reads each and every one of their books, and when they run out searches the New York Times Bestseller list or Oprah's Book Club reads to find another author to stalk read. I am grateful that I have been able to read some authors that I otherwise would not have (from sites such as Tomoson); the author of my latest review, Chantel Rhondeau, being one of them! I think that the title of this book fits it perfectly. If I had to describe this book in two words, I am pretty sure that CRIME and PASSION would be the two that I would choose. It starts out on the beach of a small ocean side town, where the town newbie, and dog walker (Madeline) finds the dead body of a local child and wife beater, and also gets a glimpse of the possible murderer fleeing the scene. The responding officer (Donovan) is a well-known player, and I'm not talking football. In a thrilling story line, you find out that Donovan has strong feelings about men who abuse women and children (making him a possible suspect), an even stronger interest in Madeline, and a tattered past. While they work together to solve the mystery of who killed this man, they learn a lot about one another, and the lengths they will go to persevere and stand-up for what is right. A murder, mixed with some love and conflict is the perfect recipe for a romantic thriller! I enjoyed that this book was told from both Madeline's and Donovan's perspectives. I appreciate when an author can do that and have it remain cohesive. It is so intriguing to get into the heads of the characters individually versus experiencing it all from one point of view. The text was very easy to read as well. I found myself breezing through chapters without even realizing it. The characters are very personable and believable; easy to relate to. If I was not the parent of two young children I may have finished this book in just a day or two, however it probably only took me four or five days total. If this sounds like your genre of choice, or you like to read any and everything, you can grab yourself a (digital or print) copy on Amazon, and I highly recommend you do. I give this book 10 stars!